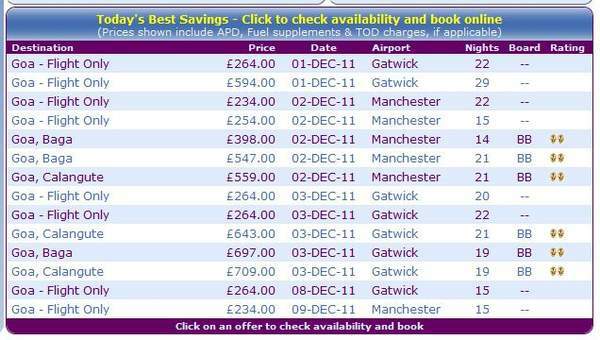 Just seen a 2 week charter flight from Manchester to Goa on 4th December 2011 for £153.45 return-cheap to use as a 1 way ticket if you can get round visa regulations. Not just visa issues Dan, you cant use it as a one-way ticket as Indian regulations do not permit arrival on a charter and return on scheduled. It is, of course, a very cheap way of having a two week holiday in Goa. If it is with Thomas Cook or one of their brands, pay by credit card as they may still hit problems despite their £200 million bail-out. In fact, I was under the impression it worked both ways.......in other words in by charter/out by charter, in by scheduled/out by scheduled. It's possible they were refused boarding if they were flying out of Goa on Qatar for instance.But flying out of Mumbai is not a problem if you have arrived on a charter flight into Goa,i've done it myself on a couple of occasions and also booked quite a few others. John, I'm sure we have had this discussion before. I am not disputing that you and others known to you have done this without problems. Equally, I know of people who have had problems. 1. Introduction : Government has reviewed the guidelines for operation of tourist charter flights to and from India and further liberalised the conditions for operating these flights subject to the condition that tourist charter flights will be permitted only for 'Inclusive Tour Package' (ITP). 2. Inclusive Tour Package (ITP) is defined as a round trip for a predetermined period for one or several pre-determined places charging an inclusive consolidated price for the airfare for all segments, hotel accommodation and other ground arrangement services like visit to tourist places. Of course, by simply supplying charter flights this may have entered a grey area, potentially allowing the carrier to claim to be a "proper" airline. It's possible they were refused boarding if they were flying out of Goa on Qatar for instance. This is just the sort of problem that can cause chaos for an unsuspecting traveller, and why I brought the issue up again, as it is a likely scenario for someone travelling in the manner described initially (cheap one way flight etc). Whilst officialdom at Dabolim is undoubtably inefficient, ill-informed and corrupt, surely they would be basing that refusal on some sort of ruling? Maybe nycank could have a quick look at this and give us the benefit of his opinion? I agree this is a very grey area as far as flying in and out of India is concerned.It looks to me as the Aviation Ministry have not updated their pages for a long time.For instance it basicaly says that if you arrive on a charter flight it has to be part of a package.Now,for a number of years Uk charter companies have sold flight only..together with a one night accomodation voucher,which in effect is against the ministries directive. I will try to find the current guidelines as i'm sure they must be online somewhere. definitely handy to have Indian visa and wait for a last minute deal! !